The Book Arts Program offers semester-length, for-credit classes in the design, art, craft, and concept of the book. Letterpress I & II; Bookbinding I & II; Artists’ Books I & II; and Book Arts II are offered through the Department of Art and Art History. Typographic Communication and Book Design is offered through the College of Architecture and Planning’s Multi-Disciplinary Design program. Additional courses in art, English, design, and new media count toward the Book Arts Minor, Certificate, and Modular Creative Writing/MFA programs. Letterpress I, Bookbinding I, and Artist's Books I fulfill the University’s Fine Arts requirement. Most classes meet in the Book Arts Studio, located on level 4 of the J. Willard Marriott Library. 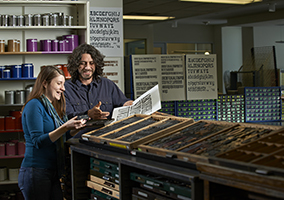 Students enrolled in academic classes gain proficiency in the spacious studio, fully equipped with printing presses, large collections of metal type and zinc cuts, and extensive bindery equipment. The Book Arts Program is a division of Special Collections, and book arts classes regularly make use of the collection—viewing artists' books and historic examples in the adjacent Rare Books Classroom and nearby Special Collections Reading Room. Student work and other book-related exhibitions are regularly displayed in the Special Collections Gallery in the level 4 atrium. The Book Arts Program engages students from diverse disciplines and backgrounds—from art majors to math majors to graduate students to non-traditional students with advanced degrees. The Program welcomes those who are new to artistic practice, as well as seasoned studio users. Often drawn to the tactile, material, physical practices of bookmaking and the book's creative and conceptual potential, BAP students are artists, writers, makers, craftspeople, collaborators, and thinkers. They are forward thinking practitioners who put new twists on old techniques and community-minded participants who shape ideas through critique and a shared studio environment.